Kevin Warren was named Chief Operating Officer of the Minnesota Vikings on February 12, 2015. Warren’s extensive experience in all facets of the organization create the perfect foundation for him to lead the business operations of the organization. Warren will continue to create the vision and strategic efforts for all departments and, along with Mark Wilf and Zygi Wilf, set the strategic vision for the business components of the franchise. Since being promoted to COO, Warren has continued to play a critical role in all business, financial, legal and operational aspects related to U.S. Bank Stadium. Warren has been involved in the design, construction, business, legal and operational components of the new stadium. Warren has also played a key role in the design, development and planning of Twin Cities Orthopedics Performance Center, the Vikings headquarters in Eagan, in addition to the ancillary real estate development of Viking Lakes. The TCO opening capped an eventful early 2018 for the Vikings. The team hosted the NFL and sports fans worldwide at U.S. Bank Stadium for Super Bowl LII on February 4, 2018, roundly lauded as one of the best-organized and safest Super Bowl games in memory. Under Warren’s visionary leadership, the Vikings restructured the organization, hiring or promoting 9 employees to Vice President, 3 of which are women. The Vikings have directed their focus on creating departmental synergy and collaboration, increasing financial profitability for the franchise, improving communication, developing leadership initiatives, implementing a platform focusing on a positive community impact through the new Minnesota Vikings Foundation, launching a women’s initiative program, creating an elevated fan experience and building a world-class franchise focused on the tenets of hard work, ethics, financial profitability, community service and a “best-in-class” mentality. Warren completed his 20th NFL season and 14th with the Vikings in 2018. He is the highest-ranking African-American executive working on the business side for a team in the NFL and is the first African-American COO in NFL history. In September of 2013, Warren’s reputation and NFL experience were recognized when he was named a member of the NFL Committee on Workplace Diversity (which he continues to serve), which is committed to enhancing and promoting diversity at every level of the NFL. In February of 2017, during Super Bowl LI festivities in Houston, Warren was honored with the Texas Southern University Pioneer Award, recognizing Warren’s ground-breaking role as an NFL executive and his commitment to championing diversity. Prior to joining the Vikings, Warren worked for the international law firm of Greenberg Traurig from 2003-05, playing a critical leadership role with the Wilf Ownership Group deal team during the acquisition of the Minnesota Vikings.  Additionally, he spent 2 seasons (2001-03) with the Detroit Lions as Senior Vice President of Business Operations & General Counsel and 4 seasons (1997-2001) with the St. Louis Rams as Vice President of Football Administration, and Vice President of Player Programs and Legal Counsel. Warren was an integral part of the Rams organization when they won Super Bowl XXXIV over the Tennessee Titans in January of 2000. Warren’s first exposure to sports law came after he graduated from Notre Dame Law School. He worked at a law firm with Mike Slive and Mike Glazier specializing in representation of Universities charged with NCAA violations. Warren also later worked as a sports and entertainment attorney/agent representing various professional athletes, entertainers and broadcasters as the founder of Kevin Warren and Associates. As a freshman on the University of Pennsylvania basketball team, Warren was a member of the Quakers’ Ivy League championship team in 1982. A native of Tempe, AZ, Warren subsequently enrolled at Grand Canyon University in Phoenix, earning his undergraduate degree. While at Grand Canyon, he excelled both in the classroom and on the basketball court. Warren scored 1,118 points during his career at Grand Canyon and earned GTE/CoSida Academic All-America honors as a senior along with NAIA Academic All-America honors and NAIA District 7 Basketball Team honors as both a junior and senior. In March 2012, Warren was inducted into the GCU Athletics Hall of Fame, the 16th individual inducted and only the 5th basketball player to earn the prestigious honor in the University’s history. Warren earned his bachelor’s in Business Administration from GCU in 1986, his MBA from Arizona State University in 1988, and his Juris Doctorate degree from the University of Notre Dame School of Law in 1990. Warren is a licensed attorney with the State Bar of Kansas, Michigan, Minnesota (House Counsel-Rule 10), and the District of Columbia. Several members of Warren’s family have helped fuel his life-long passion for sports, including his father, the late Dr. Morrison Warren, Sr., who played professional football for the Brooklyn Dodgers in 1948 during the era of the All-American Football Conference, before the league was merged with the NFL. The senior Warren would go on to be the first African-American President of a major college bowl game when he was named President of the 1982 Fiesta Bowl Board of Directors and was recently named one of Arizona State University’s 50 Greatest Football Players. Warren’s oldest brother, Morrison, Jr., was one of the first African-American scholarship athletes at Stanford, playing football for the Cardinal in the early 1960s, before a knee injury cut short his promising athletic career. Philanthropy is an integral part of Warren’s life and he and his wife Greta are active members of the Minneapolis-St. Paul community. In 2012, The Warren family “adopted” Lucy Craft Laney Community School in Minneapolis, which is predominantly African-American and has 98% of its student population coming from under-served communities. Over the past five years, the Warren family has donated over 4,000 backpacks filled with school supplies to Lucy Laney and other Twin Cities elementary schools. The Warrens have also purchased athletic uniforms for the boys and girls basketball teams, school uniforms and donate their time mentoring students. In 2014, the Warrens created Carolyn’s Comforts in conjunction with the University of Minnesota Masonic Children’s Hospital and are donating $1 million to a pediatric emergency care fund, to honor the legacy of his sister Carolyn Elaine Warren-Knox who passed away of brain cancer. Since the inception, nearly 400 financial grants have been made to families in need. In 2017, the Warren’s launched “No Doors Closed”, a scholarship program selecting high school students from District 191, who will be first generation college students. Each of the 8 students have been awarded with a 4-year, $5,000 per year academic scholarship to attend the institution of their choice. Kevin and Greta plan to continue awarding 4 scholarships annually until a total of 16 students are in the program on a perpetual basis. Warren places a priority on civic leadership and engagement, serving on several non-profit boards, in addition to serving on a publicly traded board and has been recognized on a national basis for his leadership in the business and charitable communities. Warren is a prolific speaker and has spoken on various topics to groups locally, nationally and internationally. Twin Cities Business Journal honored Warren with the Corporate Counsel Award for Private Company-Large in 2015 and in 2016 as a Minority Business Leader. Warren has been recognized four times with the Vikings by the Fritz Pollard Alliance with their Salute to Excellence Award. His professional associations include serving on the Super Bowl LII Advisory Committee. Warren has served on the Board of Directors of Grand Canyon Education, Inc. (NASDAQ: LOPE) since 2012 and was recently named a member of the Board of Directors for Securian Financial Group, Inc. Warren was asked by University of Minnesota President Eric Kaler to serve as a member of the selection committee to hire Mark Coyle, Athletic Director for the University. His civic roles include serving on the Boards of the YMCA of the Twin Cities, the Page Education Foundation, University of Minnesota’s Medical Foundation, Minneapolis Institute of Arts, Meet Minneapolis and Greater MSP. Warren is a Life Member of the Fiesta Bowl Board of Directors. Warren and his wife, Greta, who holds a bachelor’s degree from Kansas State University, have a daughter, Peri, a student at Occidental College, and a son, Powers, a football student-athlete at Mississippi State University. The Warren family resides in Edina, MN.